Which boats have a flybridge? A Flybridge allows you to drive your houseboat from the roof of the boat. All of our 36', 40', 40W' and 44' houseboats have a flybridge. What is the deductible buydown? Insurance is included in the rental fee. However as the renter, you are responsible for the $2500 deductible of the policy. You may choose to lower that cost to $1000 at a cost of $25 per day. Some home owner's policies cover you on your vacation. Please check with your insurance company. Do you supply kid's lifejackets? We have some children's Personal Floatation Devices (PFD) on site. However, we would prefer you to bring your own to ensure a proper fit. Under certain circumstances, yes, pets are allowed. There is a $75.00 cleaning fee that will be applied. Please note that all pets MUST BE CRATED while your boat is unattended. Crates are not supplied, so you are responsible to bring your own. Do you offer 'Early Boarding'? Yes, we offer Early Boarding for the 4 day Mid-Week bookings. Time and weather permitting, you are able to leave the night prior to your booking date; or it gives you an early start the next morning. There is a $75.00 charge, and must be pre-arranged with the office. Sunlight dish soap is bio-degradable. Herbal Essence Shampoo and Conditioner are bio-degradable. Bar Soap - We sell bio-degradable bar soap at the marina. There are many different scents to choose from. How many people can sleep on each boat? How far can we get? If you are vacationing for a week, you can easily go both ways and return - to Peterborough and Gamebridge (opening to Lake Simcoe). Absolutely no crossing Lake Simcoe in our houseboats. On a weekend or a mid-week vacation, this will depend on weather conditions and what time you head out. From our location on Pigeon Lake you are able to travel 5 lakes without going through the lock system: Pigeon Lake, Big Bald and Little Bald Lakes, Upper Buckhorn Lake and Chemong Lake. How much can we expect to spend on gas? The fuel consumption depends mostly on you - how fast you drive and for how long each day. Taking the increase in the price of fuel into consideration, you should allow about $10-$15 per hour of travel. The rental fee includes lock passes, insurance, propane, all of your safety equipment, charts, and paper products (toilet paper and paper towel). The kitchen comes equipped with pots, pans and utensils. What is not included in the rental fee? The rental fee does not include 13% HST tax, fuel, $40 pumpout (the septic tank on the boat), and any damage done. Additional fees may apply for overnight dockage if you choose to stay at certain locations. What else do you rent? We also rent canoes for $10.00 per day. If you wish to rent a kayak, jetski, etc., just give us a call and we will help you make all the arrangements. Do I require a boat license? No, to rent with us, the Pleasure Craft Operator's Card is not required at this time. However, you must be at least 25 years of age and hold a valid driver's license. Upon completion of the orientation training, we will issue a temporary license that is in accordance with the Coast Guard requirements. This license is only valid during the rental agreement period with R&R Houseboat Rentals. How big is the refrigerator? Each refrigerator has a freezer. The 36', 40', 40'W and 44' have a 7.5 cu. ft. fridge. Can we travel on Lake Simcoe? We do not allow our houseboats to travel on Lake Simcoe. It is such a large body of water, the waves can get over 6 ft high. The houseboats were not designed to travel in that size of wave. Do cell phones work on the water? Yes, however it is like anywhere else - it depends on who your carrier is. The best ones for our area are Bell and Rogers. Most U.S. carriers have an arrangement with Canadian carriers to pick up your service in this area. 911 also works in our area. Where can we stay at night? You can anchor in a bay, tie to an abandon shore line, or stay at the dock where you picked up the boat - all free of charge. You can stay at the locks, marinas, campgrounds and trailer parks along your route. All of them will charge you according to the facilities they offer. Call ahead or pull in and ask for availability. No, although the biggest problem we have is mosquitoes. They only last a short while. Each houseboat is equipped with mosquito coils and a burner, which is included in the rental fee. 386 kilometre (240 mile) stretch of interconnected lakes and rivers. Started in 1833 but the first full navigation of the system did not become possible until July 1920 - 87 years later! 44 Locks and 39 Swing Bridges. The Trent Severn is home to the two highest hydraulic lift locks in the world: Peterborough and Kirkfield. 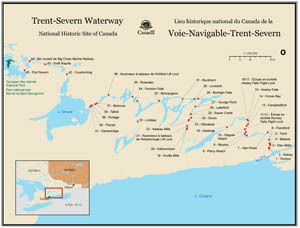 Boats travelling from Lake Ontario are raised 182m (596 feet) to the summit at Balsam Lake and then decent down 80m (262 feet) to Georgian Bay. 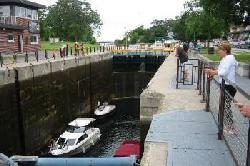 The very first lock built on the Trent Severn is in Bobcaygeon, Lock #32, which was built in 1833. Although some locks were updated during the 1960's, there are many locks that remain manual, keeping the Trent-Severn Waterway a Historic Site.